"I'm having a party, a painting party" - those are the words that I found myself singing while waiting for my morning coffee to filter through the Nespresso machine last Tuesday. Considering that I wasn't planning to host a party, much less a painting party, it was kind of an odd song to be singing at 7:00 am. But I couldn't help it. I was still on a happiness high after watching NEW, the phenomenal 100% improvised musical in English, the night before. 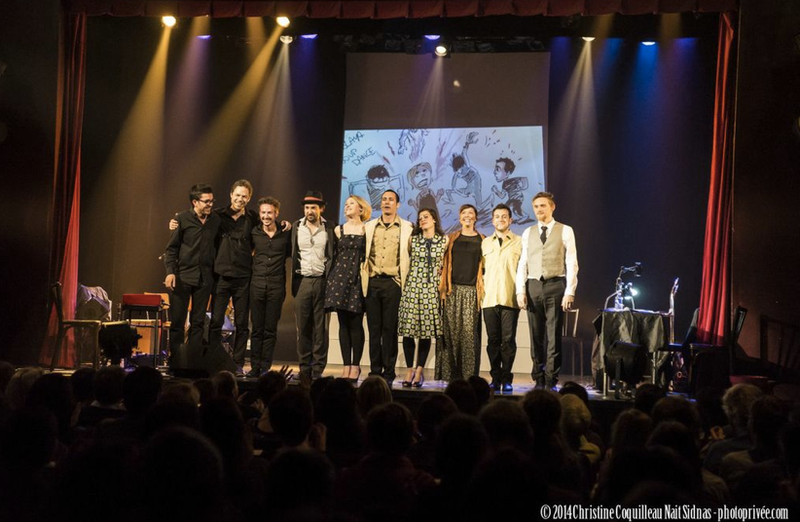 Based on NEW in French, the cult show that has delighted Parisian audiences since 2012, NEW in English features 12 professional artists from the USA, England, Australia and Ireland. During the short span of 60-90 minutes, this very talented team creates an entire musical right before your very eyes. You've got to see it to believe it. And, even then, you'll wonder how they do it. The fun started when the Master of Ceremonies, who orchestrated the entire adventure, pulled a couple of titles proposed by the audience out of a hat. On the evening in question, we were asked to vote for either "Lost and Found" set in a Louisiana swamp or "The Red One" set in a tennis club. 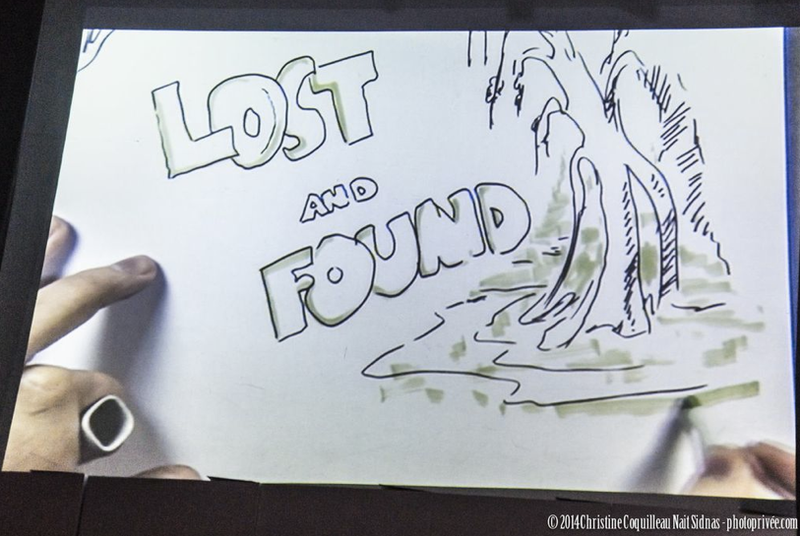 As soon as the MC declared that "Lost and Found" was the winner, the scenographer began designing the set. 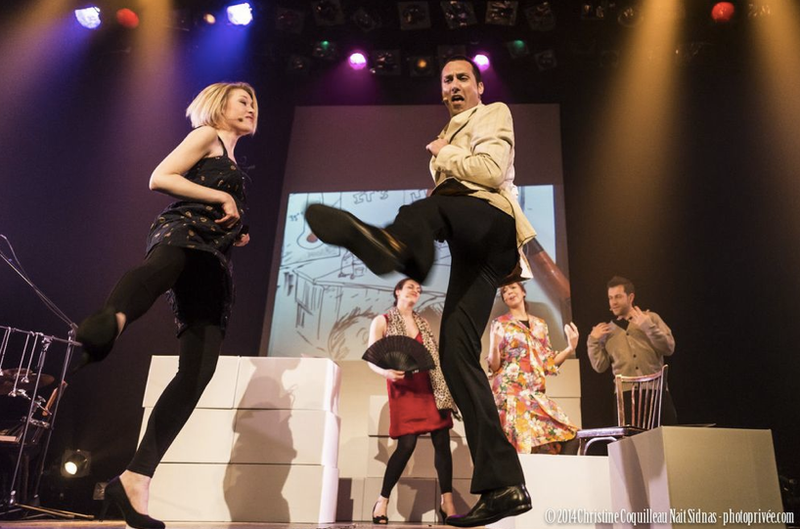 Shortly after a member of the audience provided the opening notes of the musical, the actors, musicians, and scenographer accomplished the seemingly impossible: they invented a thoroughly engaging musical within minutes. The plot took unexpected twists and turns whenever the MC asked for audience participation. My favorite moment was when someone in the audience supplied the word "jambalaya" in response to the MC's question, "What does she want to eat?" It was a true test of the cast's ability to improvise because it was the first time that some of the performers had even heard of this traditional Louisianan dish made from rice, chicken, Andouille sausage, shrimp and spices. Since every performance is 100% new, I plan to take Stéphane to the last show of the season on Monday, May 26 at 8:00 pm. That way, we'll both wake up singing. Tickets 19 € / 13 €. Available at billetreduc and fnac. This was the most amazing musical I’ve ever seen! The MC prompts the audience for ideas to drive the plot, the illustrator and band inspire the actors, and the actors create the songs and dances! Everyone is so talented and so creative. If you want to feel happy for days, run and see the next showing of NEW. You'll love it too. Fantastic concept with a cast of talented actors and phenomenal musicians! I've been 3 times so far, and each night, not only does the theme change, but it's never the same group of actors, musicians or illustrators. The ever-changing model is not only 100% adaptable to the particular taste of any given audience - but allows for multiple viewings without the slightest itch of boredom. There are several show stopping and LOL providing improvisers and most of all, some spectacular broadway deserving vocal performances (Laura Woody, Lexi Kendrick ,Olivier Yann Raynal) from the leading roles! I'll surely be back for a great night out with friends! I'm so behind on reading things and only just catching this. It looks fantastic and now I'm disappointed I didn't know about it while it was happening. Oh well!